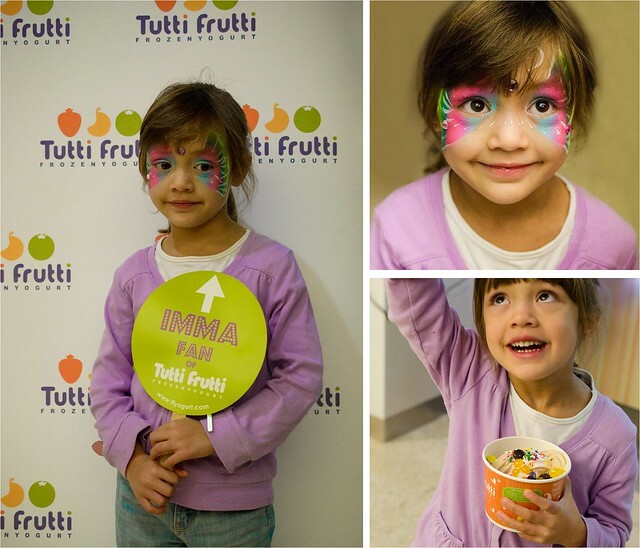 Tutti Frutti frozen yogurt has been a favourite with Aditi and me, ever since we were introduced to this cool chain of self serve frozen yogurt by Marlow Moo. Aditi and I both love the Whyte Avenue location, as its close to school, and to the hopping, fun area that I love spending time at. We go there fairly often, and love the cool, family friendly space that has enough space to play and eat. TF then opened up in Southgate, making it even more scarily accessible to my froyo crazy little bat. Now, every single trip to Southgate elicits the plaintive whine for TF yogurt... and to be honest, I don't mind giving in everytime once or twice. The Whyte Aveneue location of TF is a lot bigger than Southgate, but Southgate is easier in terms of access for me. And now, to make things better, TF is now open in West Edmonton Mall. I go to West Ed fairly often, maybe not as often as Southgate, but enough to want to have a sweetener (no pun, honest) for Aditi to induce her to put up with my endless shopping. I will make no bones about the fact that I do love shopping, and WEM is definitely my mecca :) Having a TF Froyo here makes things a lot easier. And the fact that its practically right under Williams Sonoma and the soon to arrive Pottery Barn is just topping on the yogurt. Its by far and away Aditi's favourite place in the world, and the little bat has tried practically every single flavour on offer. So how could I refuse when I blackmailed my way in was kindly invited to their opening? As you can see, Aditi is now definitely the unofficial 'face' of the chain and was papped several times :) She was thrilled to have her choice of yogurts and toppings, and I indulged her with some of her favourite ones (usually she gets a small portion, topped with healthy fruits, seriously... really!) She was ecstatic, and spent her time chowing down her treat, and I went around randomly snapping pictures of beautiful yogurt creations. The West Ed location is smaller than Southgate and Whyte Ave, and they only have six flavours on offer at any given time. But the cool, upbeat vibe is the same here as it is at their sister locations, even though there is no dedicated seating. Not that it ever stops us, mind. We arrived in time for the media preview, and were the first in line to try out the classic flavours being served that day. I also took the opportunity to chat with Angela Seto, the entrepreneur who brought the TF chain to Canada, and to Gene Yong, the franchisee who owns the Southgate location, and was thrilled to hear that they were all planning to open several new locations all over Edmonton. I know of one little person who will certainly be thrilled at the news. Not including all the big people (ahem, I am talking about you Lillian, Diane, Andrea and Marlow) and me, of course! We had a great time at the opening of the WEM location, and by the time we left, the line for free froyo had basically stretched all the way to around a couple of blocks (phew, thank goodness for media passes) Aditi had a fabulous time with all the fun kid activities and face painting sessions, and I personally, couldn't think of a better way to spend my birthday morning. And to paraphrase a certain Terminator... we will certainly be back!! 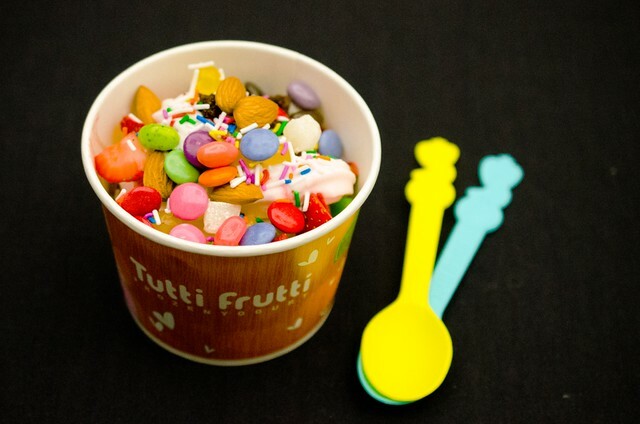 Tutti Frutti Frozen Yogurt locations are at Whyte Avenue, Southgate Centre and the newest one is at West Edmonton Mall. Do check out their Edmonton Facebook page for all the latest news and flavour updates. They are also on Twitter. Check out Diane's review here. I would like to recommend yogurt flavored cupcakes. They taste so heavenly. 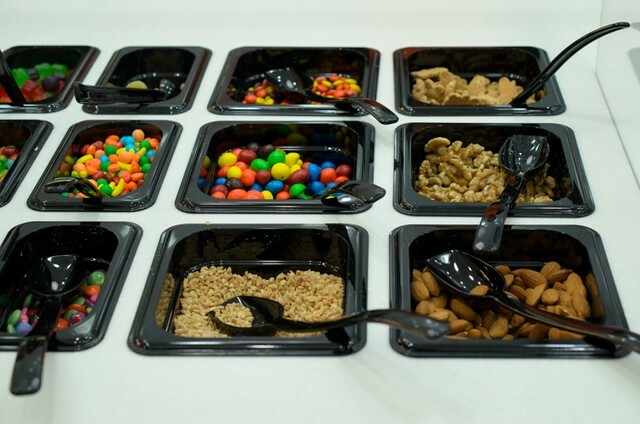 What's more is that you can use sprinkles or cream like vanilla for exquisiteness.